I was invited by Disney Springs to come preview some of the new merchandise coming to the Disney Parks in 2019! We were given a first look at new Kate Spade bags, new ears and even a donut umbrella! I shared a lot in my Instagram Stories, I even saved it in my highlights in case you missed it! View the story here. In this post you will find some more detailed photos and some of the information they shared with us! First up let’s talk about EARS! First I want to mention that the donut ears that have been out at Disneyland for a little while will be coming to Walt Disney World on January 31st! Now let’s look at the rest of what they showed us, all set to hit the parks this Spring! The new Small World Ears are full of adorable details. The front of the ears features the word Hello, while the back says Goodbye. They also mentioned that this bow is intentionally smaller than the rest of them to go along with the “small world” theme. The colors in this pair are so beautiful and the ears themselves are full of sequins. These Lollipop ears are coming as part of the D-Lish collection which is filled with whimsical food inspired items! They wanted to make these as realistic as possible so they made from a really light weight plastic. I also love that the bow on these mimics a piece of candy! It looks like some of the classics are also getting an update in 2019 as well! The classic Minnie Dot bow ears are getting a new bow, and a new comfort fit headband. The original black and red sequin Minnie ears are being updated, as well as the silver sequin Minnie ears! We got to see the silver sequin pair, they have added a more puffy bow and a castle sequin accent! The first pair on this ear display is really pretty in person. There is a broader collection coming that will accent those colors. Something they mentioned to us was they they are going beyond black and red for Minnie Mouse and they want to play around with more color combos! The other two shown in the photo below are both inspired by Spring! There is a new collection of ID Holders coming in Spring as well! Here is a look at the Minnie inspired one! Next up let’s talk about handbags! The first is another bag in the Mickey 90 series! I love how this pattern has like a scrapbook feel to it. There is also a dress coming to the dress shop with this pattern on the bottom. This bag is set to arrive in Disney Springs and the parks this Spring. The next collection they showed us is also coming this Spring, in honor of the new Dumbo movie. This collection has three pieces which you can see in the photos below! The team I got to speak with also mentioned a lot of the new Dooney and Bourke bags they are working on feature a surprise alternate print on the bottom of the bags! Next up is maybe my favorite thing we got to preview. It was just approved that morning by the Kate Spade team to be shown to us. These will all be Disney Parks exclusives and will not be sold in Kate Spade retail stores. … and a pink background! I love the little Mickey charm on these. I am a huge Kate Spade fan, and this is my favorite material of her bags. They hold up really well and the lining is super dreamy. We also got to see the card holder and large tote in this as well. The new D-Lish collection is filled with whimsical treats! While in the past the merchandise team has focused on more realistic food and snack inspired things, the new collection is filled with a more whimsical play on park treats! 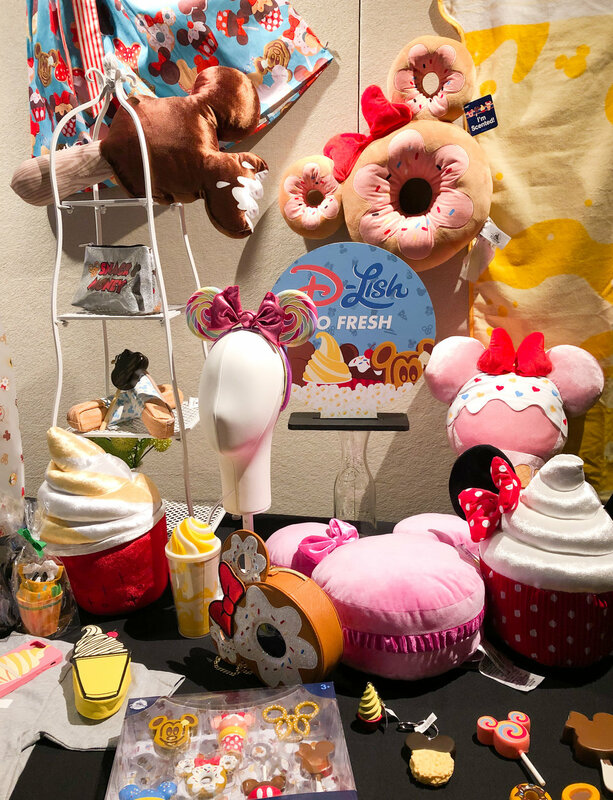 My favorites in this collection are the sweet scented plushies, the Dole Whip sipper and the donut ear umbrella! More color focused collections are coming soon! While the Potion Purple collection may have been out for a while, we got to see a few new pieces of it, including the DOG SPIRIT JERSEY how cute is that?! The team also told us to be on the lookout for more color focused collections like this one and the millennial pink one. There will also be pop ups called FLASH COLORS those are items available in one item pop ups! The first one they shared is Dapper Dan Yellow which will be available in a Spirit Jersey! New Pins & Patches coming to Disney! How fun are these Aladdin, Emperor’s New Groove, Villains and the Lion King patches coming to the Patched collection soon?! We also got a look at some of the new pin packs coming. I love the Monsters INC one! The best part of our day was getting to talk to some of the designers behind the products we love in the parks! They told us this is just the beginning of all of the new things coming in 2019! A huge thank you to the team at Disney Springs for hosting me for this event.